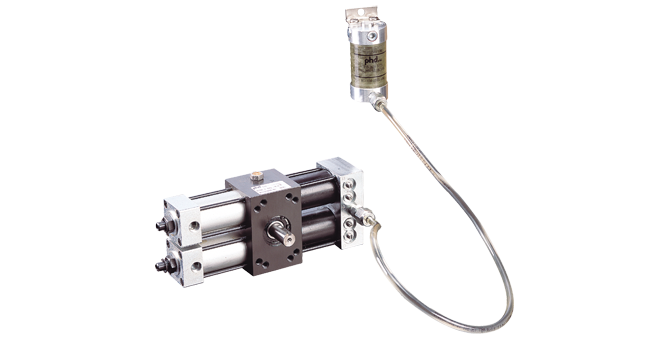 Rotary Actuator | Air/Oil Tandem | 2000-8000 | PHD, Inc.
Series 2000-8000 Air/Oil Tandem Rotary Actuators provide the smooth control of hydraulics with the simplicity of pneumatics. One end of the actuator is a closed loop hydraulic control member while the other provides pneumatic power to the rack. Series 2000-8000 Rotary Actuators are designed for heavy duty pneumatic applications where additional control is needed. Four sizes available in both 2 and 3 position models, standard built-in flow controls.